Before I get onto the recipe, let me just say a bit about its original source: Living Without Magazine. My sister-in-law gave me a subscription for Christmas and I’ve enjoyed tremendously each issue I’ve received. It’s main emphasis is on celiac disease and gluten-free foods, but there is plenty of information for a variety of food allergies and restricted diets of all kinds. Each issue comes with a resource page of substitutes for various things like wheat flour, eggs and the like. Regular features include Q&A articles with allergists and news in the celiac/food allergy world. New treatments, new discoveries, recent studies are all covered. And of course, there are plenty of recipes featured, most of which are allergen free, and even if they’re not, they come with adaptations to make them so. For example, a recent article featured the rise of sesame allergies in the US. Sesame is already a top allergen in other countries around the world, but the increasing exposure to ethnic foods is increasing the rate of sesame allergy here in this country. This was of particular interest to me because my Certain Little Someone is one of those who has a sesame allergy, which is ranked just below the “Big 8” in the United States. Other interesting recent articles discussed the pros and cons of training dogs to detect life-threatening allergens – a concept I had never even thought of but found intriguing. Chefs offer tips on how to cook without certain foods and what to use as the best substitutes in various recipes. All in all, I highly recommend this magazine as a worthy investment for any family dealing with food allergies. The current issue has a cracker recipe I’ve been wanting to try, but when I actually sat down to make it today, I realized that it called for plain dairy-free yogurt. All I had was vanilla kefir and I didn’t think that would work too well, so off I went to search for an alternative recipe. 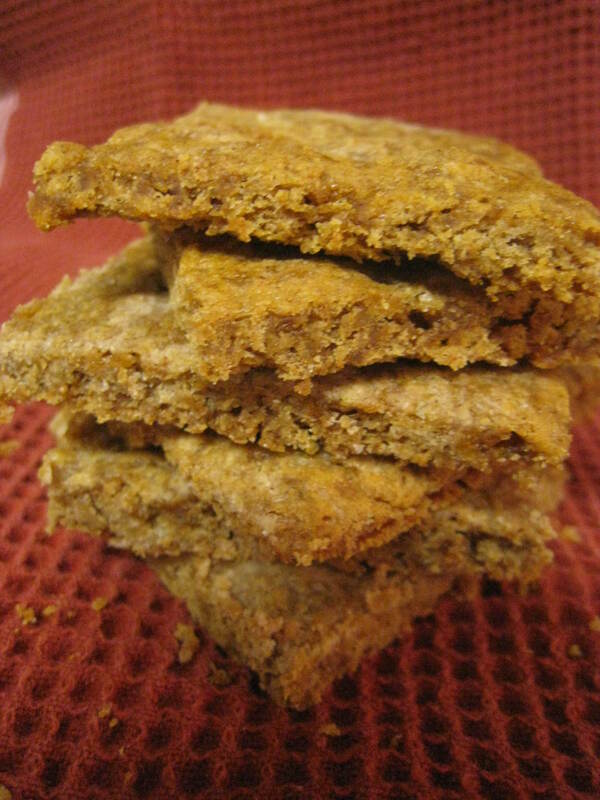 I ended up finding one on the magazine’s website: Gluten-Free Graham Crackers. I adjusted the recipe slightly to what I had on hand and what I wanted to use. It was my first experience using sorghum flour, and over all, I’m very pleased with it. I won’t use it too often, because it’s too expensive, but it seemed the best flour to use for this type of recipe. I used a sorghum flour-based flour mix found in another issue of Living Without. It’s very simple: 1 1/2 cups sorghum flour, 1 1/2 cups potato starch (not flour), 1 cup tapioca starch. Whisk together and store in a dry, dark place. Whisk together dry ingredients in a large mixing bowl. Add coconut oil and blend with pastry blender until mixture is crumbly. Add remaining ingredients and stir until dough can be manipulated into a soft ball, adding cold water 1 TBSP at a time if necessary. Cover dough and refrigerate one hour. Roll out dough into a large rectangle between two plastic zippered bags (Rip the bags down the sides to form long sheets of plastic. This is sturdier than wax paper or plastic wrap). Peel off the top plastic bag and flip the dough onto a lightly greased cookie sheet. Peel off the remaining plastic. Score the dough with a knife to form square or rectangular cracker shapes. Bake in a 325F oven for 10-15 minutes or until golden brown. Remove from oven; cut through the scored lines to separate the crackers, but leave on pan to cool for a few minutes. Remove crackers to wire rack to cool after a bit. These were delicious, and tasted amazingly like “real” graham crackers! The recipe made enough to freeze the extras and keep some on hand for quick – and portable – snacks for my Certain Little Someone. These babies are a lot of work, but totally worth it for a spectacular Fourth of July celebration! Everything is made from scratch, except the chocolate, which is just melted chocolate chips. 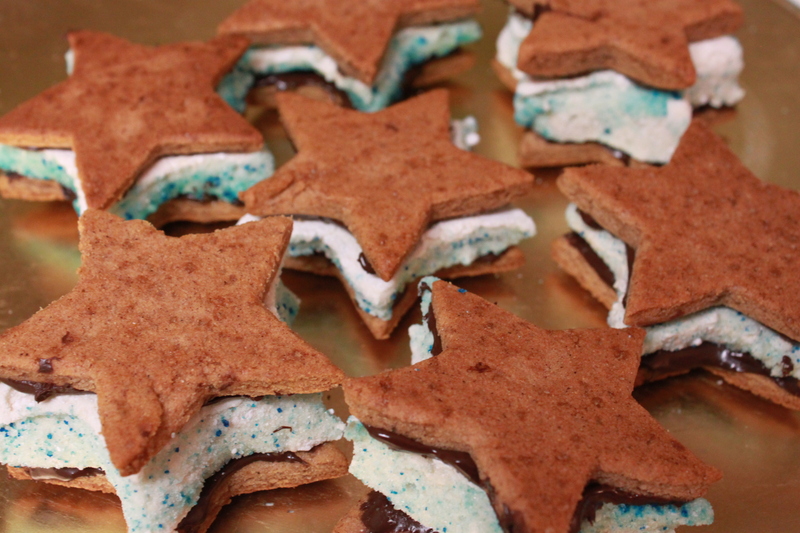 If you want to make these, plan on making the marshmallows first (giving them adequate time to set), then the graham cracker stars, and then assembling them. I found the marshmallow recipe on Food.com, and made it pretty much as it described. I like that it’s also corn-free, which I think is healthier, and also great for those with corn allergies/sensitivities. Pour 1/2 cup water in a small bowl, and sprinkle with gelatin. Set aside. In a large saucepan, stir together sugar and remaining 1/2 cup water. Cook over medium heat until dissolved, stirring constantly. When sugar is dissolved, add gelatin and bring to a boil, stirring occasionally to keep it from sticking to the bottom. Remove from the heat, and pour into the bowl of a stand mixer; allow to cool to room temperature. Stir in salt and vanilla, then beat on high speed with the whisk attachment until fluffy and doubled in volume, about 10 minutes or so. Sprinkle sifted powdered sugar over the bottom of a 9×13 pan and pour marshmallow mixer into it, smoothing the top. Allow to set until you can touch the surface with your finger and it doesn’t stick. Using a greased spatula to help release it from the pan, turn marshmallow onto a surface sprinkled with either more sifted powdered sugar or colored blue (or red) sugar. Cut out stars with a metal star-shaped cookie cutter, dipping it into a bowl of hot water in between each cut. Roll each star in your sugar of choice until all surfaces are covered. 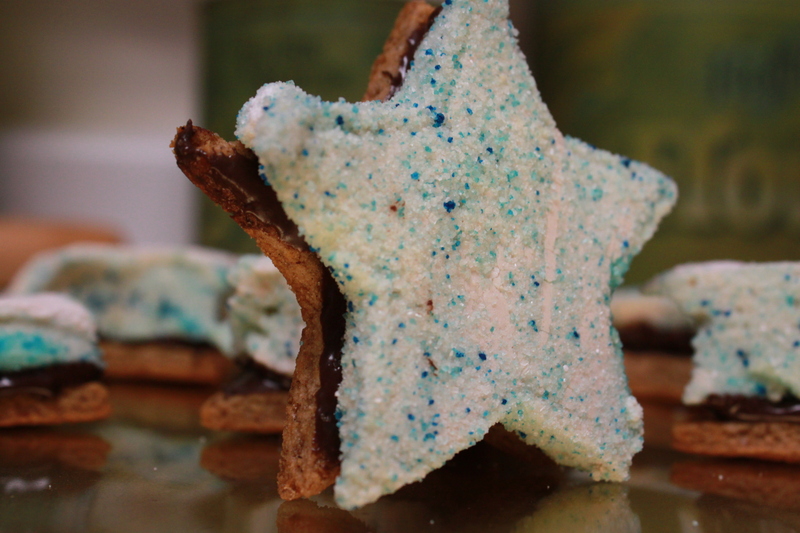 For the graham cracker stars, I simply used my allergen-free graham cracker recipe and rolled and cut it into star shapes instead of squares. Whisk together dry ingredients in a large mixing bowl. Add coconut oil and blend with pastry blender until mixture is crumbly. Add remaining ingredients and stir until dough can be manipulated into a soft ball, adding cold water 1 TBSP at a time if necessary. Cover dough and refrigerate one hour. Roll out half of the dough into a large rectangle between two plastic zippered bags (Rip the bags down the sides to form long sheets of plastic. This is sturdier than wax paper or plastic wrap). Leave it pretty thick, around 1/4″ or so. Peel off the top bag, and use a star-shaped cookie cutter to cut out stars. Continue until dough is gone. Place the stars on lightly greased cooking sheets and bake in a 325F oven for 10-15 minutes or until golden brown. Remove from the pan to cool on a wire rack. Melt the chocolate chips at in the microwave at 50% or 60% power, stirring every 15 or 20 seconds. Use immediately. 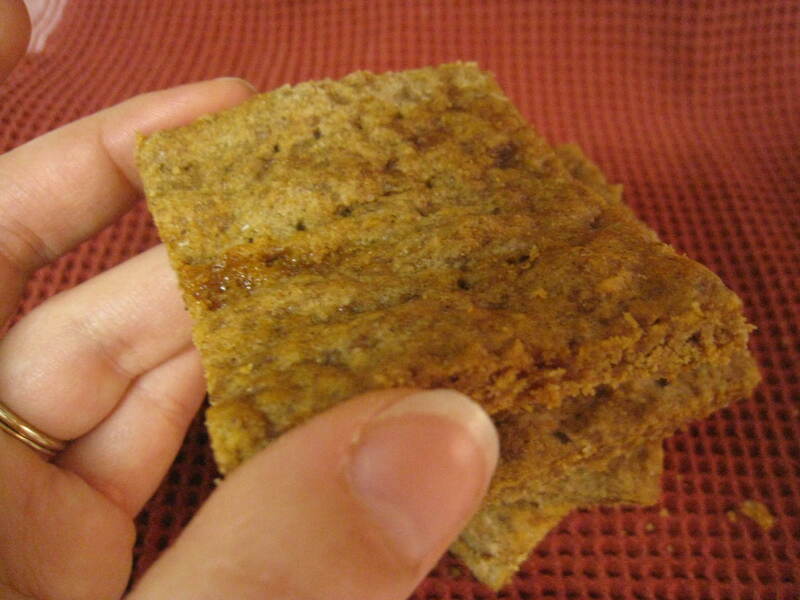 Use a knife to spread a small amount (about 1 tsp or less) onto the surface of a graham cracker star. Immediately top with a marshmallow. 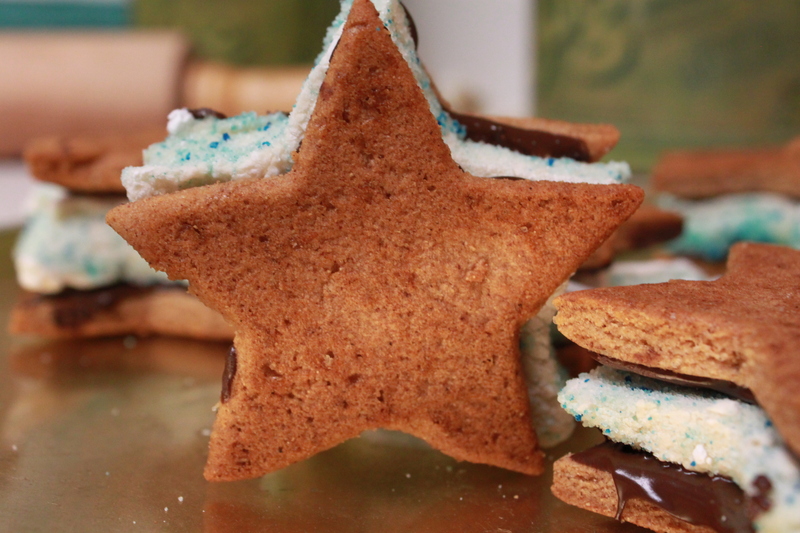 Leave as is, or spread chocolate on another graham cracker star and place it on top of the marshmallow to form a complete sandwich. Allow to cool until the chocolate is set.